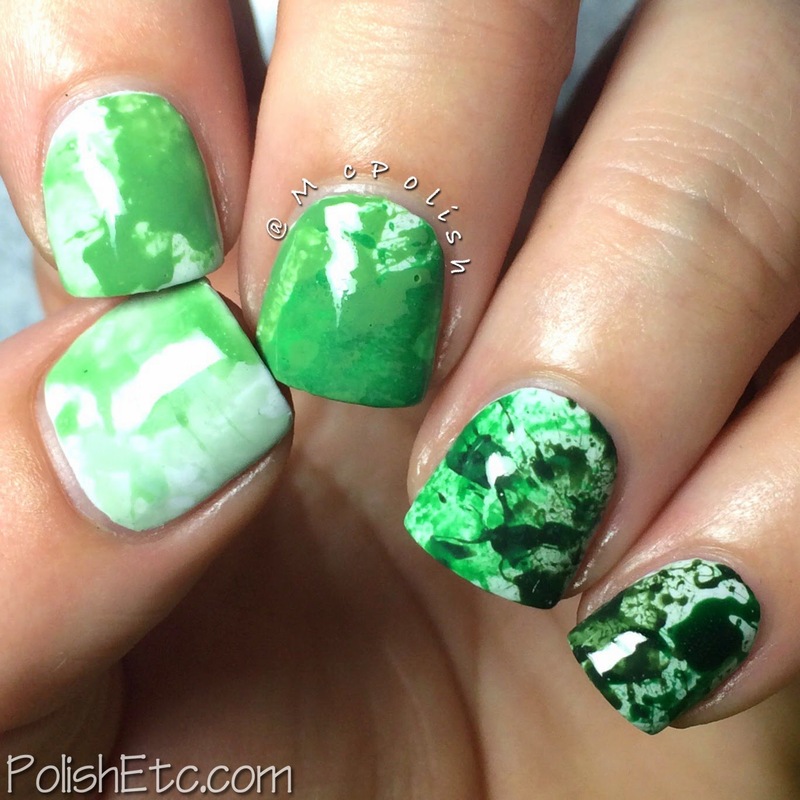 31 Day Nail Art Challenge: Week 1 Roundup - Polish Etc. So the yearly nail art challenge is upon us. If you are not familiar with the 31 Day Nail Art Challenge, stop by Chalkboard Nails for more info. But basically, you push yourself to create new nail art to share every day for 31 day based on a list of prompts. I have been posting my creations daily on my Instagram account but decided to do weekly recap blog posts. So here are my manicure for the first week of the challenge! Click through for all the nail arts! For this mani, the only polish I used was the white base. I used gel pens to hand draw the paisley design. A great tip...put a matte top coat on your base color and allow that to dry before drawing the design. Once it dried, I applied a glossy top coat. Splatter nails! I decided to do an ombre green splatter effect for this mani. I used a white base and several shades of green nail polish. I used Elmer's glue to pain around my nail bed to aid in clean up. Splatter nails are such a mess, but well worth it. I used all China Glaze polishes to create this look. I used three polishes from The Giver collection. The gradient was made from "Release" and "History of the World" using a makeup sponge. Then I used a thin coat of "The Outer Edge" over top. This white microglitter is so cool. I can't wait to use this for some winter nail art! I kind of phoned it in for this look, but hey, they all can't be amazing. Ha! I used a lovely grey linear holographic polish from Bliss Polish called "Alice" as my base. Then I went through my charms and picked out all the black and white bows. I am sorry I do not remember where all of my bows came form. Some from nail art supply stores, some from Winstonia Store and some from Daily Charme. Well I hope that you all enjoyed this first weeks round up! I am going to try my very best to make it through the entire challenge this year. Last year, I faded out after 3 weeks. But I am really going to push myself this year. There are a TON of bloggers and Instagrammers that are participating in the challenge this year. You can find all of the awesome nail art being created by searching through the #31dc2014 tag on Instagram, Twitter, Facebook and Pinterest. Lots of talent and lots of nail art inspiration to be consumed with that tag! Wish me luck for next week! That splatter manicure is so fantastic! Well, all your manicures are fantastic, but splatters really do it for me. Yes! The matte top coats makes it so much easier. I will need to try it with Sharpie's and see if it works too. Thanks for the matte top coat before drawing tip...I'm gonna try that!